Today I traveled to Hartford, Connecticut by the way of the American Mercury dated June 1, 1813. There I found an extract of letter from an officer to his father. He writes from Sacket’s Harbor pertaining to the Battle of York, “We arrived at this place last evening from Niagara. The body of General Pike was with us. He was killed by the explosion of a magazine, on which a vast collection of stones, shots, and other missiles were collected. I was wounded; but, thank God, not dangerously….”. Also reported in this issue is the Siege of Fort Miegs and the death of Major Stoddard. “…I am sorry to inform you that Major Stoddard died the night before I left the Rapids, of a lock-jaw, produced by a slight wound from a fragment of a shell which struck him on the thigh…”. 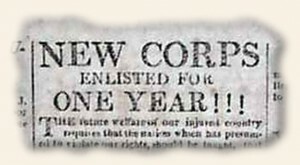 The back page of the issue carries a “New Corps Enlisted For One Year!! !” advertisement. This contained a quote from an European political writer “…The Americans are active in their person: they are enterprising; they are brave; and, which is of vast consequence, they are, from education and almost from constitution, SOBER, a virtue not at all less valuable in the Army than it is in domestic life…”. Remember these names from the “golden era”?